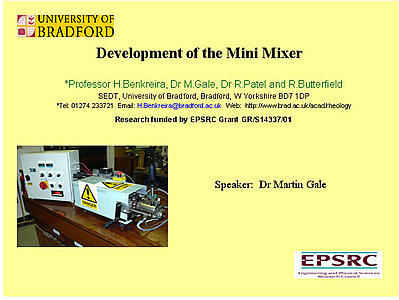 This Powerpoint presentation concentrated on the mixers inception and preliminary experimental work. The research programme currently being undertaken at Bradford University will be covered in a journal paper towards the end of the year. Many polymer laboratories both in industry and academia need to compound very small quantities of plastics materials to incorporate additives. Whilst factory production and pilot scale facilities can use twin screw compounding extruders and internal mixers, laboratory work is often hampered by either the unavailability of small compounding equipment or the limitations of existing machines. To meet this requirement, the author developed a small batch mixer to compound about 20g of material in a convenient form for evaluation by standard methods. A prototype made by Jones Engineering Services (Shrewsbury) became the subject of a research project at Bradford University with 3 sponsoring plastics companies and supported by EPSRC. (grantGR/S14337/01). The machine was designed to have both the mixing performance and versatility of a typical twin screw compounding extruder. 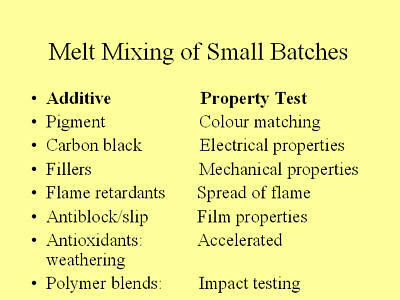 In this slide, some typical examples are given of additives used in plastics compounds and the property test needed for their evaluation. 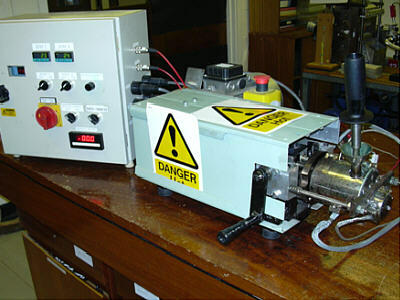 In many cases the test results can be influenced by the compounding technique and consequently any small laboratory mixer must have the versatility to create the shear stresses and shear rates needed to produce compounds equivalent to factory production. The compounded sample should be easily converted into a form suitable for testing. 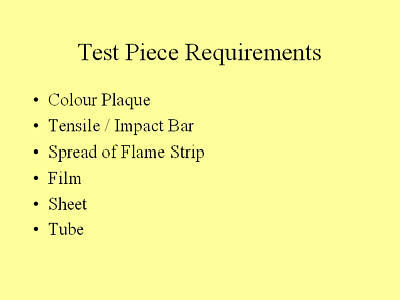 If not readily attained, then the materials wastage and extensive time can substantially increase testing costs and delays can cause production losses. Such problems are described in section 2.4. At an early stage in the design work to turn a concept into a set of drawings, these basic requirements were considered essential. 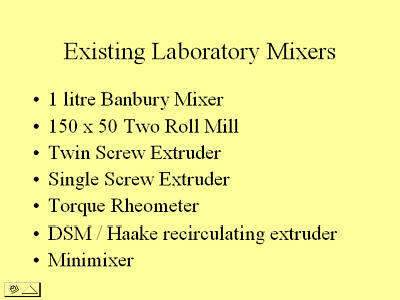 In many years of laboratory plastics processing, the author had found it necessary for very small batch compounding to use one of the first 5 machines listed in this slide. The 1 litre Banbury (or internal) mixer was ideal for rubber mixing but for plastics (in addition to being too big), there were contamination and handling problems of discharged materials. With the 150 x 50mm two roll mill, materials other than rubber or PVC would either not band or conversely stick to the rolls to an extent that removal was difficult. The twin screw extruder was good in all operating respects but cleaning time could be extensive and significant quantities of material were required to establish stable compounding conditions. The machine was also very expensive. The screw in a small single screw extruder was easily removed and cleaned, handled small to medium batches, but had poor dispersive mixing. The Torque Rheometer was a genuine small batch mixer holding about 35g and would satisfactorily compound many materials although its dispersive mixing was limited by the non-intermesh of the rotors. The main problem was discharging the mixed material in a readily usable form. There were also hazards in handling very hot metal parts and potential exposure to rotating parts when discharging and cleaning. With a principal role of a rheometer it was very expensive. 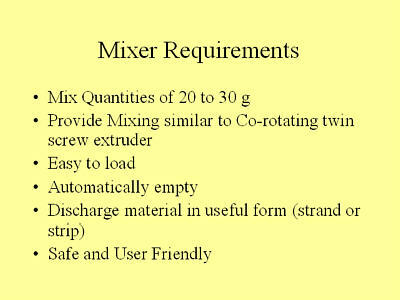 The author has no experience of the DSM original and derived mixers but they appear to meet more of the requirements in Slide 4 than any described above. Examples are the Thermo-Haake "Minilab" which doubles as a rheometer and has a charge weight of as little as 8g. and the DACA holding 6g. These mixers consist of a conical twin screw extruder with a recirculation channel and a discharge port closed by a valve during mixing. Lastly we have the Minimixer, which is described, in the following sections. It is useful to discriminate between these two mixing components, even though in practice both will occur at the same time. 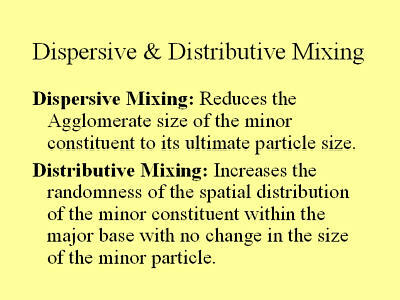 Dispersive mixing is particularly important in the preparation of masterbatches. Hence twin screw compounding extruders are widely used as they are particularly good for this operation; being able to give good dispersion with many additives that have a tendency to form agglomerates, as well as readily accepting and conveying powders. Single screw extruders have a poor dispersive mixing performance. In single screw extrusion of finished products such as polyethylene pipes, good dispersion has already been achieved by the colour masterbatch supplier, whilst good colour/masterbatch distribution can be achieved by fitting a peg mixer, Cavity Transfer Mixer etc., depending on distributive mixing performance required. In the case of the Minimixer, by duplicating the mixing elements of a twin screw compounding extruder the dispersive mixing of such a machine can be reproduced. The addition of an interacting in-line screw ensures there is good distributive mixing. These are similar to a Twin Screw Compounding Extruder, except that being a batch mixer, time can be varied considerably. 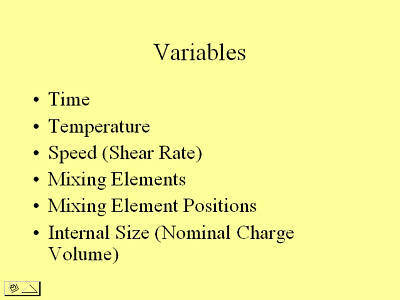 Mixing element geometry can be flexible and internal volume can be changed by altering its length. The mixer has a 3 phase AC motor with inverter variable speed drive, and worm reduction gearbox followed by a "splitter" gearbox with 3 co-rotating output shafts. 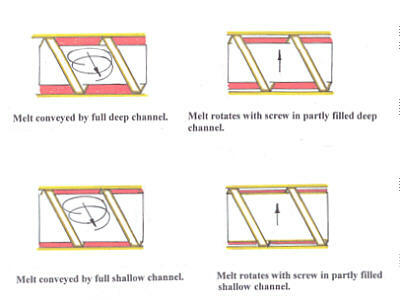 Two shafts drive turn closely intermeshing rotors within a figure-of-eight configuration barrel the same as a co-rotating twin screw compounding extruder. The third turns a screw in a separate bore, open to the rotor bores which conveys polymer pellets and additives away from the feed port and die during mixing, but when reversed, pumps the mixture out through a Die. Loading is via a hopper and feed pipe that has a manually operated piston to assist feeding as necessary and prevent material escaping during extrusion discharge. For safety, opening and closing is by rack and pinion arrangement operated by turning a handle which opens by moving the barrel and die away from the mixing elements and screw. As an additional safety feature the opening head opens a microswitch, which prevents the drive working. An emergency stop button is also fitted. A series of experiments was carried out to measure the effectiveness of the screw in emptying the mixer for different charge weights. In the "Mix" position the screw conveys polymer and additives from the feed hopper base towards the main body of the mixer and away from the die. When mixing has been completed, switching to "extrude" causes the screw to reverse and convey material in the opposite direction and a strand is extruded from the die. The AC inverter drive has ramp time adjustment so that on switching screw direction it steadily reduces speed to zero in typically 10 seconds and then accelerates over 10 seconds to reach the original speed but in the opposite direction. Screw speed can be manually changed during mixing and extrusion. The strand can then be granulated and moulded or extruded for evaluation: diluted if required (as a masterbatch) with natural polymer. The splitter gearbox gives rotor speeds of approximately 3 times the screw speed and being nearly double the diameter of the screw, the rotors impose much higher shear rates than the screw. The speed indicated on the slide is that of the screw. 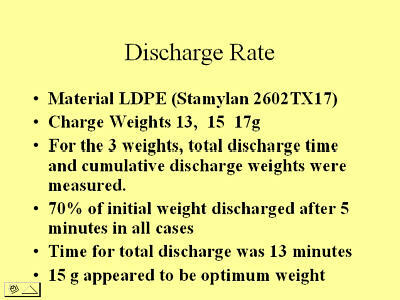 Using LDPE, total discharge time and cumulative discharge time were measured for 3 charge weights. This slide illustrates how a more efficient discharge should be possible by using a shallower screw. During emptying a point may be reached where the polymer loses contact with the "barrel"so that it rotates with the screw with no forwarding. Initially it was considered that as the screw also has to convey polymer pellets during loading, the best system was a variable depth channel, which was introduced following the above trial. However, it is now thought that a very shallow screw would convey pellets in the rotor space open to the screw much like an extruder grooved feed zone. A Phthalogreen based masterbatch in polyethylene was prepared using a screw speed of 30 rpm; charge weights of 15, 20, and 25g and mixing times of 2,4,8, and 12 minutes. In addition a charge weight of 25g was mixed for 1 and 4 minutes at screw speeds of 35, 40, and 45 rpm. The procedure used is shown in slide 30. 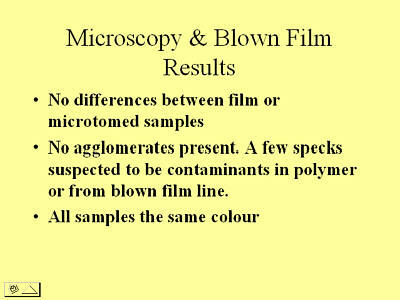 Results of particle size measurement using microscopy, colour measurements and blown film evaluation are summarised in slide 32. 3.3. Semi-conducting Polypropylene using Carbon Black. 20g semi-conducting polypropylene samples containing 10% carbon black in a high MF polypropylene were prepared for evaluation. The best procedure was to add 75% of the polymer to the mixer, and when melted, steadily add the carbon black. Screw speed was 60 rpm. The final 25% of the polymer was then added and after a further 2 minutes mixing, the mix was discharged. Feeding assistance was necessary only during the final loading stages and there was almost no mess from the carbon black. Approximate electrical resistance values were determined immediately by measurements with an electrometer between 2 probes pushed into the strand a measured distance apart. A PTC (positive temperature coefficient) effect was noted as the strand cooled. 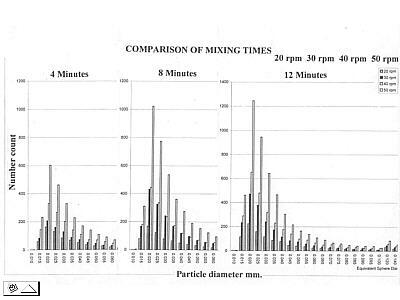 As the results in 3.2 failed to show the influence of mixing variables because all results proved to be equally good, an exercise was carried out using a material with readily measurable range of particle sizes. This was a commercially produced colour masterbatch supplied to produce streaky decorative effects. 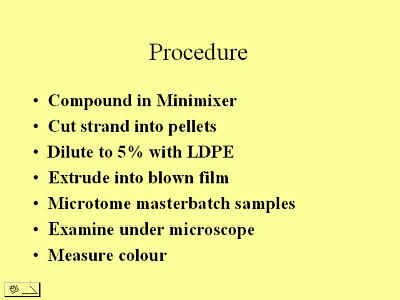 Particle size distribution was measured using image analysis on masterbatch diluted to 2% in natural polymer, using samples hot pressed from mixer-extruded strand. 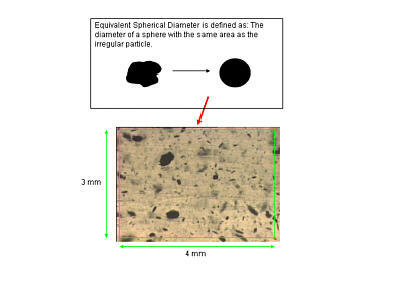 In this evaluation, particles viewed by the microscope are automatically converted to images of equivalent spherical diameter as shown in slide 33. "Optimas" counts the numbers of particles within quite narrow bands of diameter sizes and plots them as bar charts as shown in slide34. In these charts the range is 0.50mm to 0.10mm in steps of 0.020mm and in the range 0.10 to 0.010 in steps of 0.005, which can give a small discontinuity at 0.10 / 0.12 mm. This gives a chart of both manageable width and clear details in the areas of interest. In the slides shown here, the bar charts have been cut off at 0.060, 0.10, or 0.14mm to enable easier comparisons to be made between different bar charts. 3 mouldings were prepared from each mixer prepared batch. 3 separate areas were used for each measurement from each moulding and the 9 results averaged. 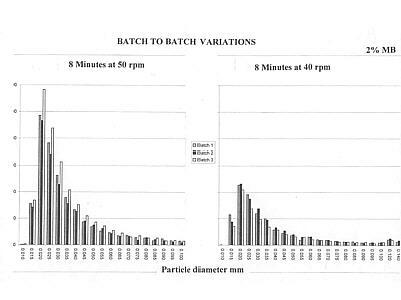 Slide 34 shows batch-to-batch variations for the 3 batches mixed for 8 minutes at 50 rpm and 8 minutes at 40 rpm. The 40-rpm bar chart is a typical result and is very consistent. The 50-rpm result is possibly the most variable so far, but even this can be regarded as reasonably good. A feature of all the charts is that their shapes are all the same with a peak always occurring at 0.020mm. 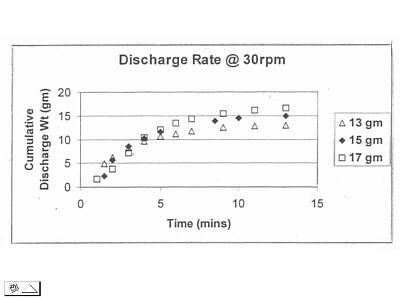 Slides 35 & 36 use the same data; 35 showing effect of time and 36 that of speed. 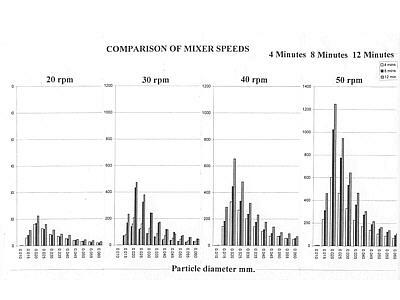 As might be expected, increasing time and increasing speed both increase the number of small particles. It should be noted that to get the graphs on the same slide, the scales for the 3rd bar chart have been changed (1200 to1400) and hence the influence of 12 minutes is greater when referring to the values. A similar situation exists for the 4th bar chart in slide 36. From a practical aspect there appears more to be gained by increasing speed than increasing time. With the Minimixer being a new machine, speed has been treated with caution, but with experience, maximum speed will probably be increased by changing the gearbox. A mixer has been designed and built which so far has fulfilled the original objectives. In particular it has proved easy and convenient to use and produces mixed samples in strand form. Risks of burns have been minimised and exposure to moving parts as associated with some other mixers has been eliminated. So far only the original barrel and mixing elements have been used, but completed work indicates that its volume could be increased, or more likely, decreased to accept smaller, more economic, batch sizes with very costly nano additives. Mixing has proved to be good: so good that it has proved difficult to find differences sufficiently significant to evaluate mixing variables with "normal" materials / formulations. The author and co-workers acknowledge the support given by EPSRC and 3 sponsoring companies, and also Jones Engineering for contributing to the engineering design.